Lancaster Councilmember Sandra Johnson delivered the keynote address for the “Respect and Connect” Del Sur Middle School Teen Summit Friday. LANCASTER – Bullying stops when respect begins, and to gain respect you must first give respect. This means treating others the way you want to be treated. This was the message Lancaster Councilmember Sandra Johnson conveyed Friday in her keynote address to more than 300 students at the “Respect and Connect” Del Sur Middle School Teen Summit, the culminating event of the school’s Not In Our School/Not In Our Town week of anti-bullying action. Johnson delivered an engaging and thorough PowerPoint Presentation on the types of bullying, factors that trigger bullying, what to do if you are being bullied and what to do if you witness someone being bullied. Johnson is speaking from first-hand experience. She said growing up she was often a target for bullying because she came from a poor household. More than 300 students packed the school's gymnasium Friday for the Del Sur Middle School Teen Summit . Lucky for Johnson, her parents countered the bullying she endured at school by instilling her with a sense of pride. “They told me ‘you were born to be unique, don’t try and copy anybody, be proud of who you are,’” Johnson said. She urged students to heed the advice of her parents. Johnson also gave examples of Hollywood celebrities and sports figures who overcame bullying and went on to be successful, including Jessica Alba who was bullied for being poor, Michael Phelps who was bullied for the size of his ears, and Lady Gaga who was teased for the size of her nose. 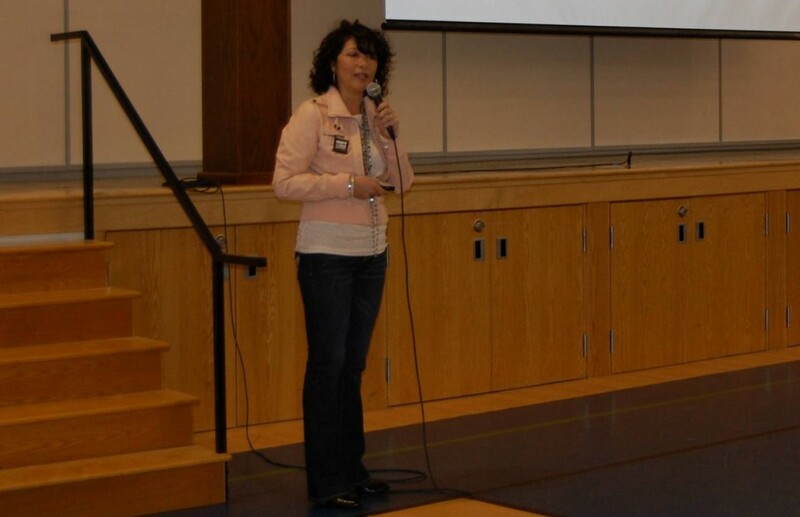 She implored students to see differences in others as unique rather than reasons for bullying. Johnson said, ultimately, putting an end to bullying starts with respecting one another. “We all want to be treated with respect, every single one of us,” Johnson said. Johnson said the quickest way to earn the respect of others is to treat them the way you want to be treated. “You’re supposed to respect every student, not just in this school, but any school,” said eighth-grader Elijah Haynes after Johnson’s speech. “I learned that I should try to respect everyone,” said eighth-grader Hope White. Following Johnson’s speech, the day-long event featured a variety of workshops provided by community members and educators. Student guests from Cole Middle School, Lancaster High School, and Quartz Hill High School also attended the summit. 3 comments for "Lancaster Council Member spreads anti-bullying message"
what a hypocrite. She bullies her employees all the time. How is it that the City of Lancaster can talk about anti-bullying when they are the biggest bullies I have EVER seen?